A string quartet is an ideal alternative to a church organ to accompany the key elements of a traditional wedding ceremony, such as the bridal procession and the recessional march. The sumptuous sonorities of the combined tones of twin violins, viola and ’cello create a rich, dynamic, almost orchestral texture. However, modern string quartets (especially those specialising in playing for weddings)don’t necessarily restrict their music-making to the purely classical ‘concert’ repertoire. In fact, the potential stylistic versatility of such an ensemble is quite astounding. 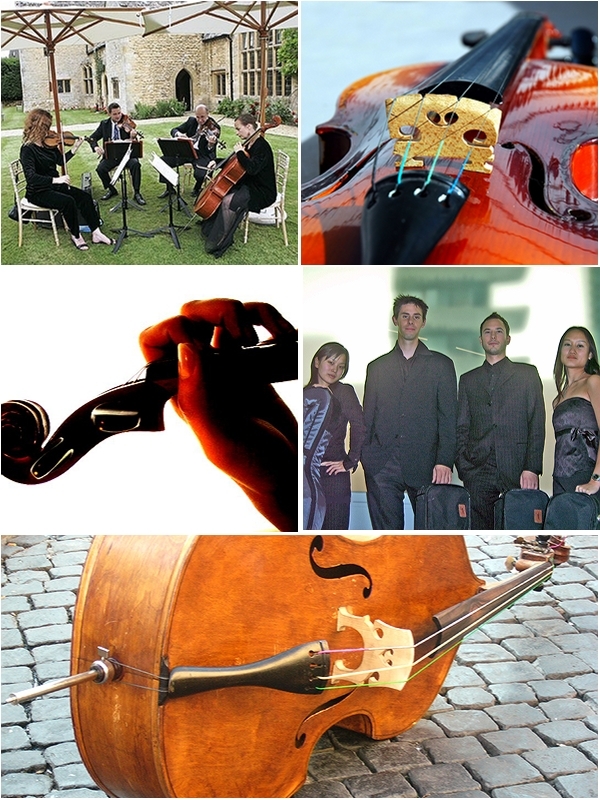 Find out more about booking a string quartet for your wedding. In fact, it’s rather difficult to think of a single genre of mainstream Western music that, given skilful arrangement, cannot be successfully approached by a string quartet – with the obvious caveat that there are no vocals! The development of popular music throughout the 20th century has thrown up new challenges which can be met with witty, effective reworkings of rock’n’roll, swing jazz, popular musicals and chart hits. A quick glance through the repertoire list of a wedding string quartet will reveal some surprising inclusions to go with the expected classical-leaning ‘standards’. If there’s a special item not appearing on the list that nevertheless you’d love to have performed at your wedding, ask the quartet leader if it’s possible (maybe for an additional fee) to prepare an arrangement of it – chances are they’ll give it their best shot! Soft background music can greet your guests as they gather in readiness for the marriage ceremony, then a processional march to announce the bridal party. Further gentle pieces cover the interlude in proceedings while the register is signed, followed by a triumphal march as the newlyweds are presented to their guests. But why stop there? The quartet could now relocate (if necessary) in order to entertain your guests with a selection of the less formal repertoire suggested above (or they could keep it more strictly classical if you wish) during the photography session and champagne reception that typically follows the conclusion of the ceremony. String quartets are not only musically versatile, they are fully portable too, as their instruments are entirely acoustic. All they will require will be enough room to manoeuvre, sufficient light to read their music, 4 chairs and suitable shelter from the elements (rain, wind or hot sunlight) if performing outside. Of course, a modicum of light refreshment will rarely be refused! If you’re looking to create an intimate, romantic atmosphere with more than a touch of class at your wedding ceremony and reception, a string quartet is the ideal ensemble to accompany proceedings. Unobtrusive, yet reassuringly underscoring an ambience of relaxed elegance, this versatile unit has stood the test of time over several centuries, and can consequently boast an unrivalled range of repertoire to match its unquestionable pedigree. I love string quartets, I think they are a ton of fun to both listen to and play in. Like Rey said, they make weddings really fun to go to. I’ve been to a lot of weddings where people use ipod playlists and it’s just not the same. You gotta have a string quartet. String quartets, for me,are almost essential to weddings. They induce a romantic ambiance especially when they can do covers of popular love songs as well as timeless classics. The music of a string quartet is always soothing to the senses.